Home » Reach Out » Into the Woods: Live Theatre Production at the Bonifacio Global City! 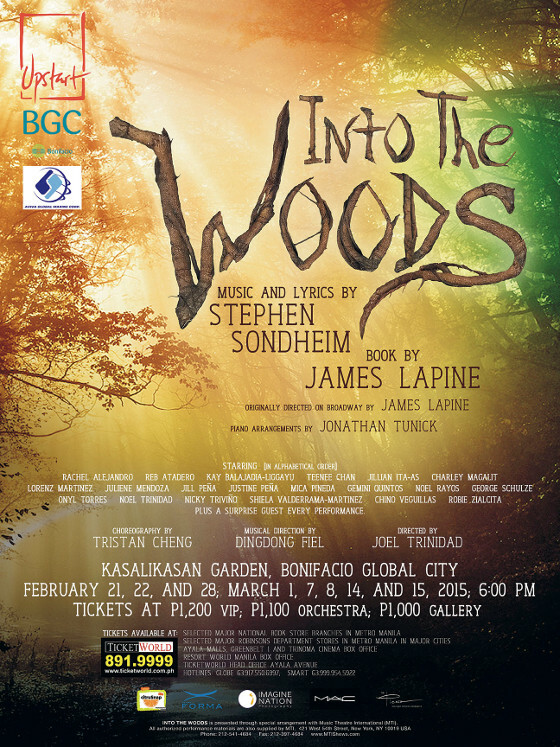 Into the Woods: Live Theatre Production at the Bonifacio Global City! From the creators of the “Forbidden Broadway” comes another play, Upstart Productions will stage a unique version of the international hit Broadway musical Into The Woods. The famed musical which earned distinct awards despite the popularity of The Phantom of the Opera in the 80’s, spiked many versions onstage throughout the world and a film adaptation by Walt Disney Pictures, sets foot in the Philippines and onto the great outdoors! Upstart Productions Inc., BGC and AVIVA present Into The Woods. 6:00 pm on Saturdays and Sundays from February 21 to March 15, 2015, at Kasalikasan Garden, Crescent Park West, Bonifacio Global City. Also brought to you by Plana Forma, Picasso, Alex Ruelo of ImagineNation Photography, Citrusnap and Mac. Tickets available from Ticketworld. Call 8919999 for details.